It really good idea to read few English bulldog care tips to know more about major problems of your dog. You’ve seen him as Spike, chasing after Tom the cat in Hannah Barbera’s unforgettable Tom and Jerry. You’ve seen him as Butch, bullying Pluto since he tried stealing the former’s bone in Disney’s favourite, Bone Trouble. The quintessential bully, the English bully has captured our hearts with his big and muscular physique, his wrinkled and smug face, and his docile, friendly but gregarious temperament. These big and loveable bullies, available here in all their funny, friendly and stubborn characteristics, make great companions – as long as we equip ourselves with the right information on proper English Bulldog care. That Sourpuss Face perhaps what makes English Bullies most memorable, aside from their lazy, friendly personality, is their wrinkled, sourpuss face. Their muzzles, pushed into their faces and cradled in flaps of skin, make Bulldogs look like they’re in a perpetual bad mood. Breeds with this physical feature are called brachycephalic dogs, and while this makes them look adorable, it also makes them more prone to both overheating and infections. 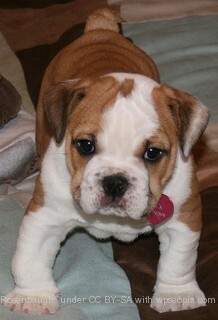 With this, purchasing one of our own loveable bullies should come with proper English bulldog care awareness. This involves protecting your burly pals from conditions that might cause them to overheat such as staying out in the sun too long or strenuous physical activities during warmer months. They shouldn’t be left out in the sun too long, and will be healthier and happier in houses with air conditioning, good ventilation, or cool floors. On top of that, the folds of skin on their faces and around their noses collect moisture, making them prone to skin infections. Grooming them would involve really getting deep into those folds to clean out any accumulated slobber and food that may lead to infection. While pudgy English Bulldogs have been popularized for their laziness and general lack of interest in physical activity, these canines actually need regular daily exercise like all other dogs. In fact, it has been found that 20% of bulldog deaths are cardiac related as the lack of physical exercise can render Bulldogs overweight. In addition to cardiac problems, overweight bulldogs may develop respiratory problems, as well as bone issues. Speaking of bone health, dog care also involves awareness of bone diseases such as patellar luxation and hip dysplasia. Patellar luxation is the dislocation the kneecap while hip dysplasia is the malformation of the hip socket, which can lead to pain and, in severe cases, immobility. In fact, the British Veterinary Association surveyed English Bulldogs as having the worst score in the hip dysplasia scoring scheme, recording a whopping 73.9% of these canines from 1979 to 2009 to be dysplastic. In order to prevent this, when you buy one of our Bulldogs, you should commit to giving it the daily exercise it needs in order to keep it from being overweight while stretching and strengthening its hips and legs. However, as mentioned, English Bulldogs cannot be exposed to too much heat as they are prone to heat strokes, and must be given lots of access to fresh water so that they can cool down and re-hydrate themselves after a bit of daily physical activity. Table scraps and other excessively fatty foods must also be avoided as canine care must involve weight management. With the right kind of English Bulldog care – awareness of heat and temperature, daily exercise and a good, healthy diet – coupled with lots of love and belly rubs, your snub-nosed, burly and friendly big bully will remain happy, loyal and content for a good 8 to 12 joyful years.